My sister and I finally finished her purse! It turned out really well. It’s so cute! 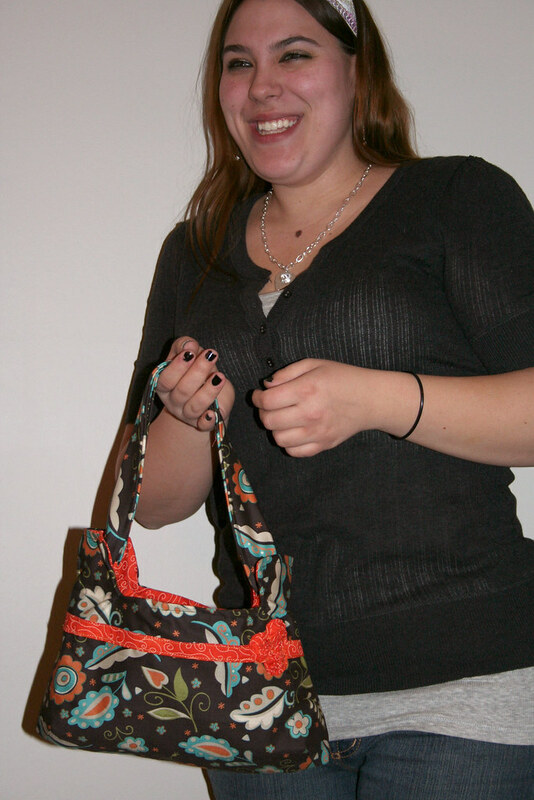 We followed the instructions for the “Charming Handbag” from Amy Karol’s Bend-the-Rules Sewing . There she is, all giggly and proud. Tomorrow is that little girl’s 21st birthday! 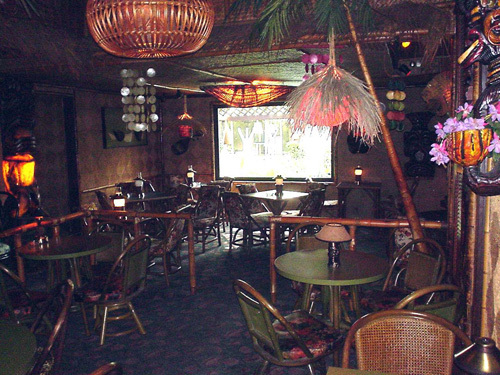 We will be taking her to the same wonderful place I went to for my 21st… The Hala Kahiki. 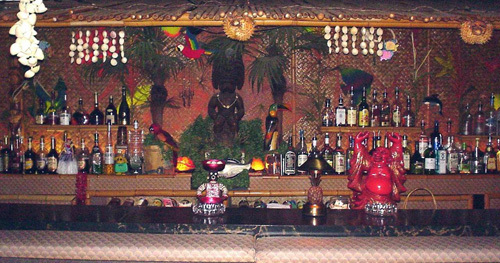 It’s the best Tiki Bar ever. We will be drinking Hawaiian Sunsets, Zombies, and Mai Tais. Per tradition, we will also try to get someone to drink a Tahitian Milkmaid… gin, grenadine, and cream. Yum? If I hadn’t know you made that beautiful purse, I would’ve thought that it was a Vera Bradley. The purse turned out well! The size is perfect! What a lovely purse. So chic! Happy Birthday to your sister and have a great time. Oh please do tell us what that fabric is and where you got it! It is fabulous. 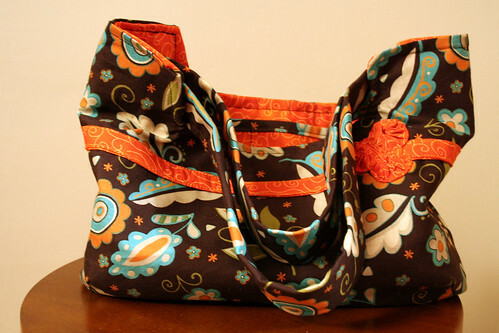 And, of course, the purse is great too :) You could make a killing selling those. You know, in all your spare time! I want one, I want one!! That is seriously beautiful! You should totally sell these on Etsy! You really could make some big bucks! I would buy one in a split second! So cute! The purse is absolutely gorgeous! 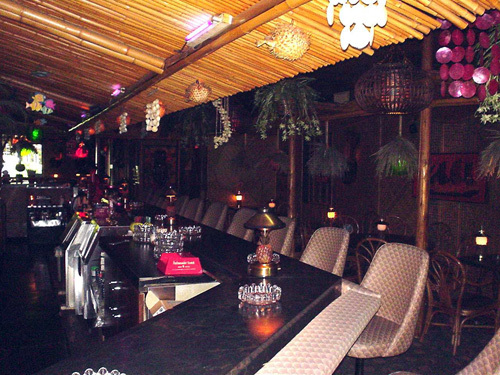 I have the tiki bar envys over here. Have fun! I made a purse from the same pattern. It’s fun! What dimensions did you use for the handle? Yours look thicker and longer than mine and I like yours much better. 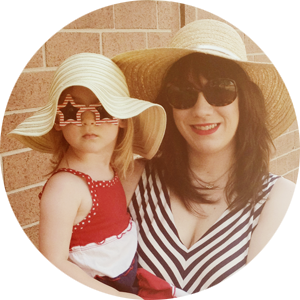 Oh, and Ashley thanks everyone for the birthday well-wishes! I’m late but I hope Ashley had a wonderful birthday! I love this bag! I love how much it can stand up on its own! 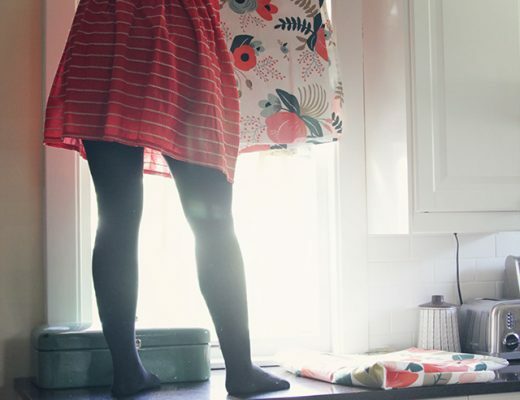 I’m looking up Bend The Rules Sewing on amazon right now! I have some crazy memories of that place! Russian mobsters, intense rules for behavior, no food except pretzels, and finally… my drink was on fire. Awesome!! LOVE the “charming handbag”!! You should sell your designs to a manufacturer – very eye-catching and lovely colours. Very fashionable colours – agree that these could be sold to a manufacturer – see a lot more drab handbags being carried around in the high streets of the UK – would be great to add some colour. At last a designer who is imaginative enough to try out wholly new colour schemes – love the design of this. It’s very very pleasing on the eye – lovely colour pallete. Aw, I would never lose a bag so precious! Love it!